CAPE CANAVERAL, FL -- The International Space Station just got a whole lot tidier. 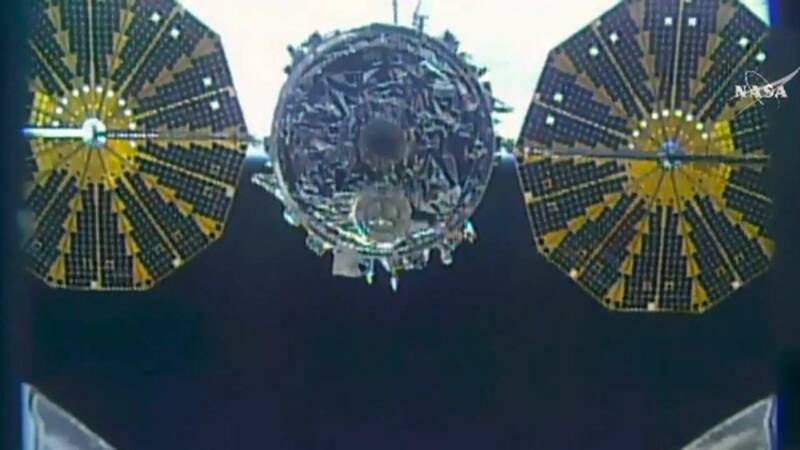 A pair of NASA astronauts released a capsule loaded with 1.5 tons of trash Friday as the space station soared over Bolivia. The capsule should re-enter the atmosphere and burn up harmlessly over the Pacific on Saturday. NASA supplier Orbital ATK launched the capsule to the space station in December, full of food, clothes and other goods. The astronauts removed the precious contents, then filled it with garbage and old equipment for incineration. Commander Scott Kelly and Timothy Kopra, the Americans on board, sent computer commands to set the Cygnus free. The stunning 250-mile-high view showed the capsule slowly backing away, its two circular solar wings looking like open umbrellas. Kelly, who's less than two weeks from wrapping up an unprecedented yearlong mission for NASA, thanked everyone who worked on the Cygnus - "this great vehicle." Virginia-based Orbital ATK plans to launch another Cygnus with more supplies from Cape Canaveral, Florida, late next month. The flight was delayed a few weeks after black mold contaminated some of the cargo bags. Technicians had to disinfect everything. NASA has handed off space station shipments to private business so it can focus on getting astronauts beyond low-Earth orbit, namely to Mars. It hopes to do the same with space station crews next year. For now, U.S. astronauts are hitching rides with the Russians.